Montana Morning by Victor Mill | P.C. Fallon Co. The awe-inspring mountain peaks and lush river valleys of Montana were the inspiration for the designers of Montana Morning bedding from Victor Mill. 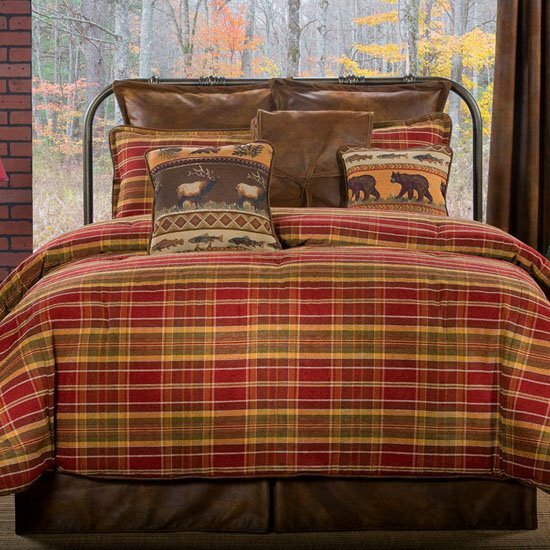 The cozy comforter and standard shams invite you to kick off your boots and settle into this handsome plaid in rich hues of brick red, honey gold and tobacco brown. The tailored bedskirt and Euro shams are created in a handsomely distressed tobacco brown faux-leather. Perfectly in tune with the rustic cabin, lake lodge, or western looks that are so popular now. Available in comforter sets, multiple piece sets called Grand Suites, daybed sets, window treatments including drapes and valances, accent pillows, shower curtain and bulk fabric. If you need a bedskirt longer than the standard 15” drop, Victor Mill offers an 18” or 21” bedskirt drop for a small additional Surcharge. Just add the desired Surcharge to your shopping cart when you purchase the other items. The surcharge is the same regardless of size of your comforter set. Polyester / Rayon blend and poly fiber fill in the comforters and spreads. Dry clean recommended. These are made to order items. Allow approximately 2 weeks for shipment. Sewn in the USA. See below for the complete listing of all the Montana Morning items. Montana Morning Twin size 3 piece Comforter Set by Victor Mill. Inspired by the rugged, dramatic beauty of Montana’s breath-taking mountain peaks and lush river valleys, the Montana Morning bedding ensemble has rustic appeal. The cozy comforter and standard shams feature a handsome plaid in rich hues of brick red, honey gold and tobacco brown. The tailored bedskirt and Euro shams are created in a luxe, fool-the-eye faux leather that is a handsomely distressed tobacco brown. This appealing bedding ensemble is perfectly on-trend for the rustic cabin, lake lodge, or western looks that are so popular now. Twin size 3 piece comforter set includes a twin comforter 72” X 96”, twin 15” drop bedskirt and one standard sham. 47% polyester / 53% rayon face and poly fiber fill. Dry clean recommended. This is a made to order item. Allow approximately 2 weeks for shipment. Sewn in the USA. Montana Morning Full size 4 piece Comforter Set by Victor Mill. Inspired by the rugged, dramatic beauty of Montana’s breath-taking mountain peaks and lush river valleys, the Montana Morning bedding ensemble has rustic appeal. The cozy comforter and standard shams feature a handsome plaid in rich hues of brick red, honey gold and tobacco brown. The tailored bedskirt and Euro shams are created in a luxe, fool-the-eye faux leather that is a handsomely distressed tobacco brown. This appealing bedding ensemble is perfectly on-trend for the rustic cabin, lake lodge, or western looks that are so popular now. Full size 4 piece comforter set includes a full size comforter 86” X 96”, full 15” drop bedskirt and two standard shams. 47% polyester / 53% rayon face and poly fiber fill. Dry clean recommended. This is a made to order item. Allow approximately 2 weeks for shipment. Sewn in the USA. Montana Morning Queen size 4 piece Comforter Set by Victor Mill. Inspired by the rugged, dramatic beauty of Montana’s breath-taking mountain peaks and lush river valleys, the Montana Morning bedding ensemble has rustic appeal. The cozy comforter and standard shams feature a handsome plaid in rich hues of brick red, honey gold and tobacco brown. The tailored bedskirt and Euro shams are created in a luxe, fool-the-eye faux leather that is a handsomely distressed tobacco brown. This appealing bedding ensemble is perfectly on-trend for the rustic cabin, lake lodge, or western looks that are so popular now. Queen size 4 piece comforter set includes a queen size comforter 92” X 96”, queen 15” drop bedskirt and two standard shams. 47% polyester / 53% rayon face and poly fiber fill. Dry clean recommended. This is a made to order item. Allow approximately 2 weeks for shipment. Sewn in the USA. Montana Morning California King size 4 piece Comforter Set by Victor Mill. Inspired by the rugged, dramatic beauty of Montana’s breath-taking mountain peaks and lush river valleys, the Montana Morning bedding ensemble has rustic appeal. The cozy comforter and standard shams feature a handsome plaid in rich hues of brick red, honey gold and tobacco brown. The tailored bedskirt and Euro shams are created in a luxe, fool-the-eye faux leather that is a handsomely distressed tobacco brown. This appealing bedding ensemble is perfectly on-trend for the rustic cabin, lake lodge, or western looks that are so popular now. California King size 4 piece comforter set includes a king size comforter 110” X 96”, Cal king 15” drop bedskirt and two king shams. 47% polyester / 53% rayon face and poly fiber fill. Dry clean recommended. This is a made to order item. Allow approximately 2 weeks for shipment. Sewn in the USA. Montana Morning King size 4 piece Comforter Set by Victor Mill. Inspired by the rugged, dramatic beauty of Montana’s breath-taking mountain peaks and lush river valleys, the Montana Morning bedding ensemble has rustic appeal. The cozy comforter and standard shams feature a handsome plaid in rich hues of brick red, honey gold and tobacco brown. The tailored bedskirt and Euro shams are created in a luxe, fool-the-eye faux leather that is a handsomely distressed tobacco brown. This appealing bedding ensemble is perfectly on-trend for the rustic cabin, lake lodge, or western looks that are so popular now. King size 4 piece comforter set includes a king size comforter 110” X 96”, king 15” drop bedskirt and two king shams. 47% polyester / 53% rayon face and poly fiber fill. Dry clean recommended. This is a made to order item. Allow approximately 2 weeks for shipment. Sewn in the USA. Montana Morning Twin size 7 piece Comforter Set by Victor Mill. Inspired by the rugged, dramatic beauty of Montana’s breath-taking mountain peaks and lush river valleys, the Montana Morning bedding ensemble has rustic appeal. The cozy comforter and standard shams feature a handsome plaid in rich hues of brick red, honey gold and tobacco brown. The tailored bedskirt and Euro shams are created in a luxe, fool-the-eye faux leather that is a handsomely distressed tobacco brown. This appealing bedding ensemble is perfectly on-trend for the rustic cabin, lake lodge, or western looks that are so popular now. Twin size 7 piece comforter set includes a twin comforter 72” X 96”, twin 15” drop bedskirt, one standard sham, one euro sham and three decorative pillows. 47% polyester / 53% rayon face and poly fiber fill. Dry clean recommended. This is a made to order item. Allow approximately 2 weeks for shipment. Sewn in the USA. Montana Morning Full size 9 piece Comforter Set by Victor Mill. Inspired by the rugged, dramatic beauty of Montana’s breath-taking mountain peaks and lush river valleys, the Montana Morning bedding ensemble has rustic appeal. The cozy comforter and standard shams feature a handsome plaid in rich hues of brick red, honey gold and tobacco brown. The tailored bedskirt and Euro shams are created in a luxe, fool-the-eye faux leather that is a handsomely distressed tobacco brown. This appealing bedding ensemble is perfectly on-trend for the rustic cabin, lake lodge, or western looks that are so popular now. Full size 9 piece comforter set includes a full size comforter 86” X 96”, full 15” drop bedskirt, two standard shams, two euro shams and three decorative pillows. 47% polyester / 53% rayon face and poly fiber fill. Dry clean recommended. This is a made to order item. Allow approximately 2 weeks for shipment. Sewn in the USA. Montana Morning Queen size 9 piece Comforter Set by Victor Mill. Inspired by the rugged, dramatic beauty of Montana’s breath-taking mountain peaks and lush river valleys, the Montana Morning bedding ensemble has rustic appeal. The cozy comforter and standard shams feature a handsome plaid in rich hues of brick red, honey gold and tobacco brown. The tailored bedskirt and Euro shams are created in a luxe, fool-the-eye faux leather that is a handsomely distressed tobacco brown. This appealing bedding ensemble is perfectly on-trend for the rustic cabin, lake lodge, or western looks that are so popular now. Queen size 9 piece comforter set includes a queen size comforter 92” X 96”, queen 15” drop bedskirt, two standard shams, two euro shams and three decorative pillows. 47% polyester / 53% rayon face and poly fiber fill. Dry clean recommended. This is a made to order item. Allow approximately 2 weeks for shipment. Sewn in the USA. Montana Morning California King size 10 piece Comforter Set by Victor Mill. Inspired by the rugged, dramatic beauty of Montana’s breath-taking mountain peaks and lush river valleys, the Montana Morning bedding ensemble has rustic appeal. The cozy comforter and standard shams feature a handsome plaid in rich hues of brick red, honey gold and tobacco brown. The tailored bedskirt and Euro shams are created in a luxe, fool-the-eye faux leather that is a handsomely distressed tobacco brown. This appealing bedding ensemble is perfectly on-trend for the rustic cabin, lake lodge, or western looks that are so popular now. California King size 10 piece comforter set includes a king size comforter 110” X 96”, Cal king 15” drop bedskirt, two king shams, three euro shams and three decorative pillows. 47% polyester / 53% rayon face and poly fiber fill. Dry clean recommended. This is a made to order item. Allow approximately 2 weeks for shipment. Sewn in the USA. Montana Morning King size 10 piece Comforter Set by Victor Mill. Inspired by the rugged, dramatic beauty of Montana’s breath-taking mountain peaks and lush river valleys, the Montana Morning bedding ensemble has rustic appeal. The cozy comforter and standard shams feature a handsome plaid in rich hues of brick red, honey gold and tobacco brown. The tailored bedskirt and Euro shams are created in a luxe, fool-the-eye faux leather that is a handsomely distressed tobacco brown. This appealing bedding ensemble is perfectly on-trend for the rustic cabin, lake lodge, or western looks that are so popular now. King size 10 piece comforter set includes a king size comforter 110” X 96”, king 15” drop bedskirt, two king shams, three euro shams and three decorative pillows. 47% polyester / 53% rayon face and poly fiber fill. Dry clean recommended. This is a made to order item. Allow approximately 2 weeks for shipment. Sewn in the USA.